Whys does the sound not work right? The volume is very low when it is set very high. Seems related to Firefox in that the sound is sometimes ok, but then after browsing, the sound out the speaker goes way down, when the volume is set to 100%. A reboot fixes it sometimes but browsing eventually turns the volume down. 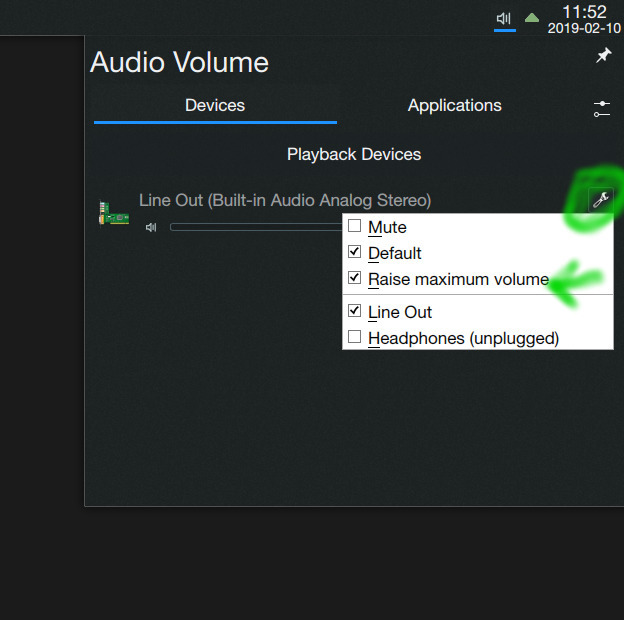 Possible PulseAudio flat volumes behaviour? flat-volumes scales the device-volume with the volume of the "loudest" application. For example, raising the VoIP call volume will raise the hardware volume and adjust the music-player volume so it stays where it was, without having to lower the volume of the music-player manually. Defaults to yes upstream, but to no within Arch. Note: The default behavior upstream can sometimes be confusing and some applications, unaware of this feature, can set their volume to 100% at startup, potentially blowing your speakers or your ears. This is why Arch defaults to the classic (ALSA) behavior by setting this to no. As so often, Arch has one of the most useful package-specific wiki pages. Thanks for the pointer! But be careful, any system alert sounds may be much louder as well now. Don’t blow out your ears!